Previously, auto insurance policies have been essentially Procrustean in nature - forcing the most diverse of policyholders to conform to whatever coverage standard the insurer thought best. The climate in today's insurance industry is entirely different. Now, the plentitude of types of auto insurance available to you is nearly overwhelming and, thanks to the Internet, at your fingertips. The types of car insurance from which you may choose are virtually limitless, which allows you to customize a policy exactly to accommodate your finances and needs. Now, because of add-ons, tailored coverage limits, and other personalizations, almost no two policies are the same. You can make your next policy truly your own. Whether you need standard comprehensive liability insurance or a more customized policy, you can find it here. Auto insurers are more flexible than ever and are willing to collaborate with you in structuring a policy that you need and can also afford. The online insurance industry is a consumer's market, so you will have your say in dealing with prospective carriers. Also keep in mind that the personalization of coverage is not limited to the types of auto insurance you choose. Many of our affiliated carriers also offer life, home, and/or health insurance, so you can further personalize your coverage to include these broader policies. The choice is yours. See the many options available to you by reviewing the articles below and completing the online form to receive free quotes. The articles below describe the different kinds of baseline coverage available to you through any major insurance provider. You can select one or multiple types of coverage, which should be heavily influenced by your state's required minimum-coverage levels, whether you own, finance or lease a vehicle, and what your current financial situation looks like. Sound like an awful lot to take in? Don't worry - we've listed examples of situations where each coverage type might work best, and when the selection of that type might not be so wise. Select a coverage type from the list below to get started! 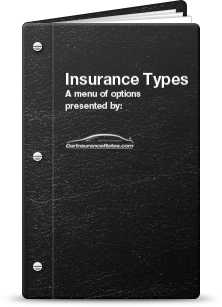 Describes a technical classification of auto insurance, but is also be used to describe coverage for non-insured persons, vehicles, etc. Comprehensive coverage typically covers any loss that doesn't result from a collision event, such as theft, vandalism, and so on. Liability-only insurance is generally understood to be the bare minimum level of coverage needed to operate a vehicle in any state. Collision coverage covers the cost of damages to the affected party's vehicle in the event you are deemed at-fault for an accident. If you drive a vehicle for business purposes, commercial car insurance coverage is a must. Protect your investments with adequate protection. Once you've selected one or a combination of coverage types, it's time to consider possible add-on options. Select an add-on from the list below to learn more about what it is, its potential benefits, and whether or not it's the right choice for your car insurance needs. Covers the difference between the amount you owe on your vehicle's loan and its actual value in the event of an accident. Medical coverage on a car policy is most often used to cover the deductible on your personal medical insurance policy, but can cover other costs, too. This add-on means the insurance provider will pay for your rental in the event of an accident. It does not cover an elective rental. Covers the difference between the amount the party responsible for the accident can pay you and what your vehicle is actually worth. Covers the total value of your losses in the event that the party responsible for the accident does not have any car insurance coverage at all. Auto insurance isn't just about picking the right coverage levels and add-on services; there are other considerations you should make to make sure you have enough coverage in the event of the unforeseen or that you're not paying for more than you need. Is it worth it to get your home insurance from the same carrier as your auto insurance? The answer to this question might just surprise you. What if your auto or home policy limits aren't enough? Umbrella insurance coverage might just be the answer if you'd rather err on the safe side. Covering your vehicle in the event of an accident is one thing, but what about coverage for non-accident events? A must-read for owners of used vehicles. What if you can't arrange for a policy before you take ownership of your vehicle? Are there other situations where a standard policy won't work?